Every person subscribing to your list expects you to reach out to them at some point. What exactly should I send them – a sales offer, a piece of advice or maybe point them to my other content? That’s what we’re going to cover today. 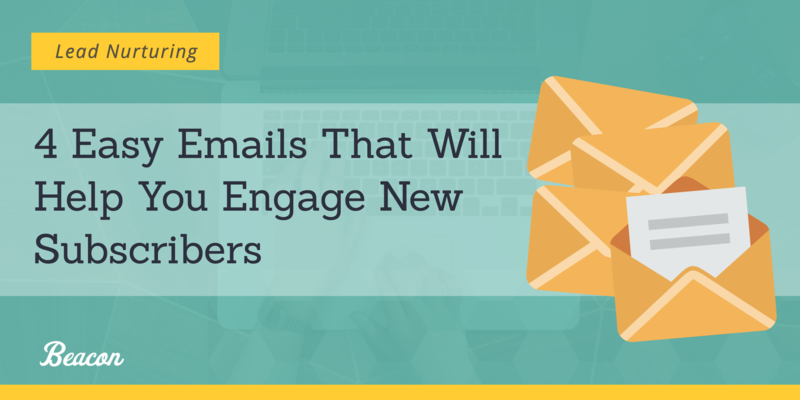 In this post, I’ll show you 4 easy emails that will help you engage every new subscriber. Sounds interesting? Let’s not waste any more time then. A welcome email is your initial response to the person’s signing up, and what you say in it can either break or make that new business relationship. You should set this message to go right after they sign up. Make a good first impression, and show off your personality. Help the new subscriber to get to know you better. Deliver value to them right away. There are many strategies for writing welcome emails. 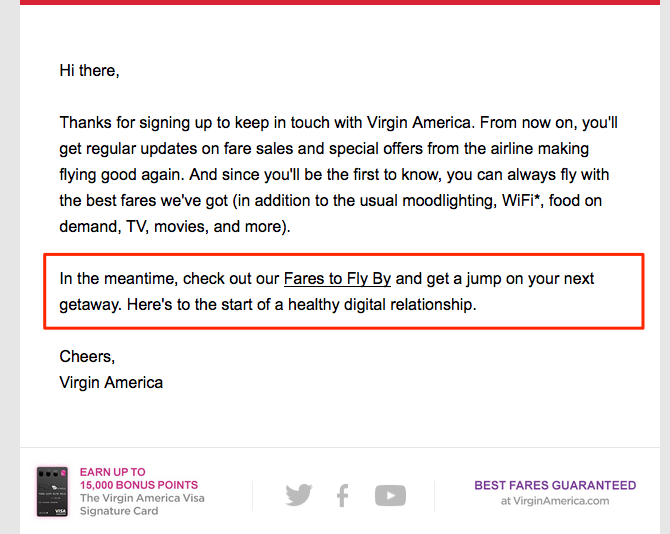 Some companies simply thank their subscribers for joining the list and go straight for the pitch. Others, use the opportunity to connect and engage their new recipients. 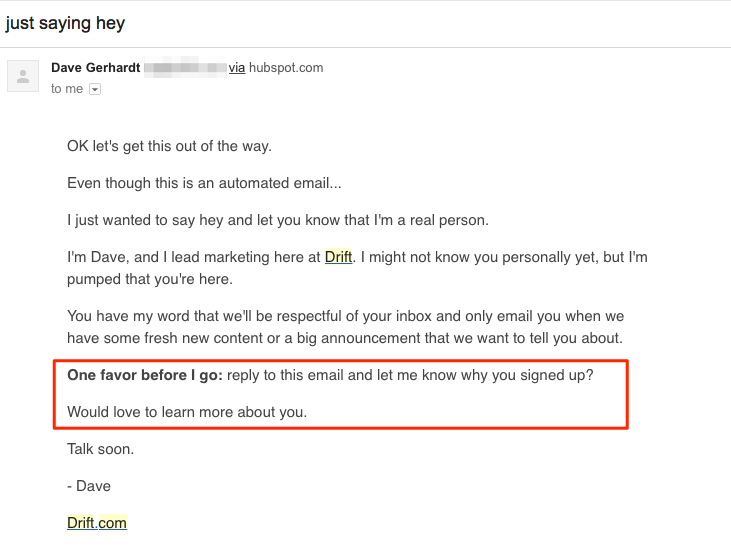 Drift.com, on the other hand, sends one of the most engaging welcome emails I’ve seen. Note that they include no links in the email, but focus on setting the expectations. And also, use the message to profile and learn more about their new subscribers. I admit, I tend to repeat myself, particularly when it comes to stressing the importance of telling your email list about EVERY new content you publish. It’s so easy to assume that your audience regularly visits your blog, and reads every new article you put out. In reality, they never do. They’re too busy. Don’t remember about it. Or simply are too lazy to check if you wrote something new. Look, I’m the first one to admit that I don’t check my favorite blogs on a regular basis either. But I don’t have to – most of them email me their latest stuff. And that’s the primary reason to message your list every time you update your blog. It will get your content in front of the very people you create it for – your audience. Set up a fully automated RSS campaign. The email program you use, be it Mailchimp, ActiveCampaign or anything else, will send a new email every time it detects new content in your RSS feed. The another option is to create a custom email campaign for every new content. And personally, I prefer this approach. Although it requires you to set everything by hand, creating custom emails allows you to be in control of your email. You can write a catchy subject line, create a relevant image (although you can send the email without one as well), and add a custom call to action. By the way, this is the approach we take at Beacon too. We publish new content weekly, and so, every week our subscribers receive an email from our CEO, giving them a sneak peek at the contents of this week’s post. “If you’re just going to send your email subscribers the same content you publish on your Youtube channel, podcast, or blog, what’s the draw to subscribe? And I agree. You must send content notifications but don’t make it the only email you send your list. You should also send some original advice you create exclusively for your subscribers. But don’t worry, this doesn’t mean that you have to write custom articles. A simple list of tips, a quick weekly tip, or something similar will work equally well. Answer a question. You don’t even have to ask your customers for those questions. Simply use Quora to find out what information your audience is asking about. Send new tool recommendation. If you’ve come across a product that you feel would help your audience, then why not tell them about it? Collect bullet points with advice on a particular topic. But let’s make something clear. 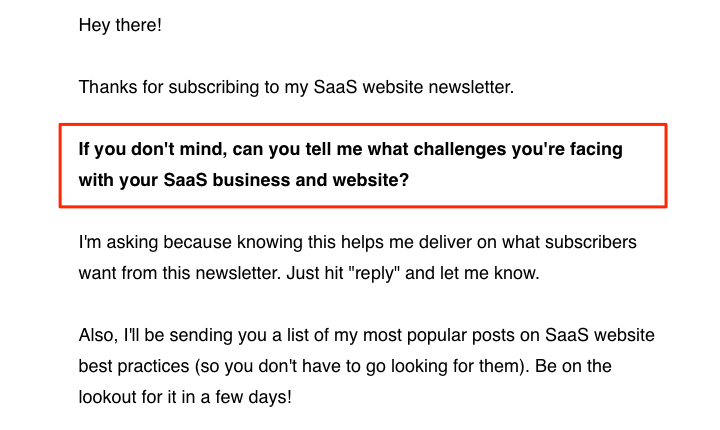 Although I talk about a weekly newsletter here, it doesn’t mean that you need to send emails every 7 days. Use frequency that works for you. Remember, it’s better to send less but more valuable emails than clog your subscribers’ inboxes with weak and quickly written advice every week. 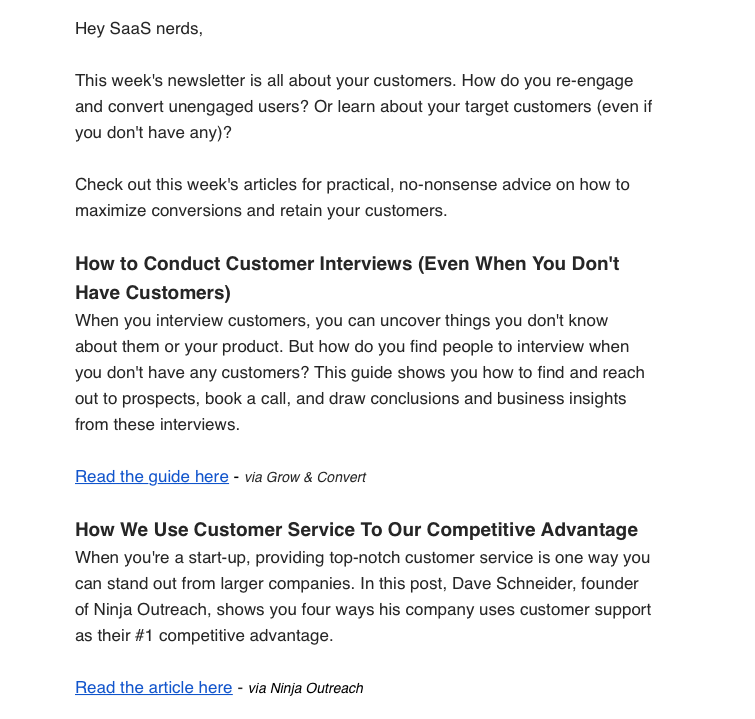 This is an email type that can help you engage subscribers in case if you don’t have enough time to create exclusive content on a regular basis. You see, instead of providing exclusive advice, you can share opinions and tips that other people have created recently. To send a curated content newsletter, you just have to collect blog posts or any other content you’ve found interesting (and that is relevant to your audience) and send it to your subscribers. And then, simply list that week’s links with short blurbs that give subscribers a quick preview of the content. 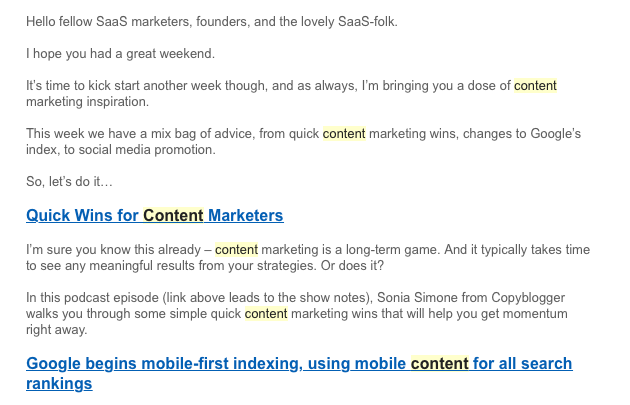 Sending those emails is as easy as adding your favorite blogs to an RSS reader (for me, it’s Feedly), and then, selecting content to include on a weekly, bi-weekly, or monthly basis. I bet that the first thing that comes to your mind when hearing about customer feedback is an NPS score. After all, it’s become a standard for assessing customer satisfaction. However, that’s not what I’m referring to as a feedback request. You see, you could use the initial communication with new subscribers to simply learn more about them. And there’s a very good reason for doing that. Develop a more targeted service offering, and much more. Send a dedicated feedback request, a message that subscribers them to answer some questions about them. Or you could merge it in other emails you send. I’ve already shown you how Drift does it. 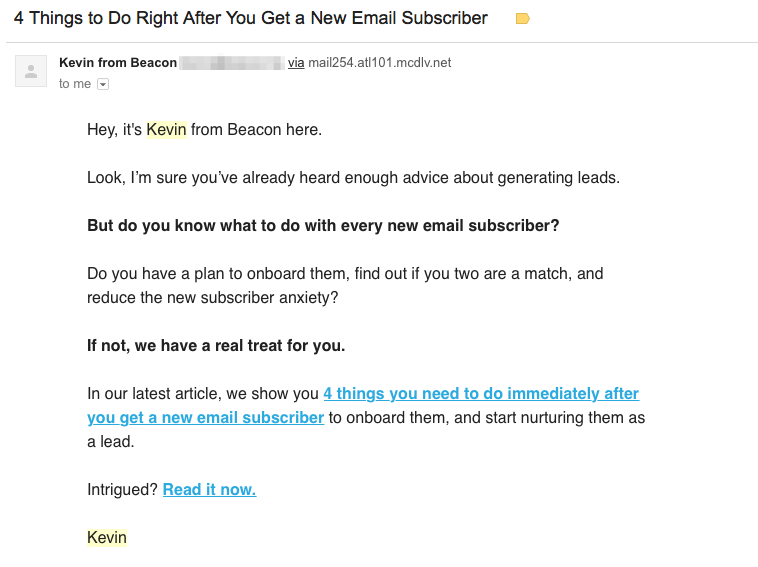 Kevin, you’ve shared some excellent advice here for bloggers who want to keep their email lists warm. I love the suggestion to answer questions from quora as exclusive content for your subscribers. That’s something I will add to my email engagement plan. Another way to engage your audience that has helped me learn more about my subscribers is surveys. Sending an email with a link to a survey has provided me numerous topics to discuss on my blog. So I’d recommend that as well. Thanks for sharing Aaron, that’s a great tip! Great and thorough post with some useful examples. Thanks a lot, guys. Good catch, thanks Gill! I just updated the post.